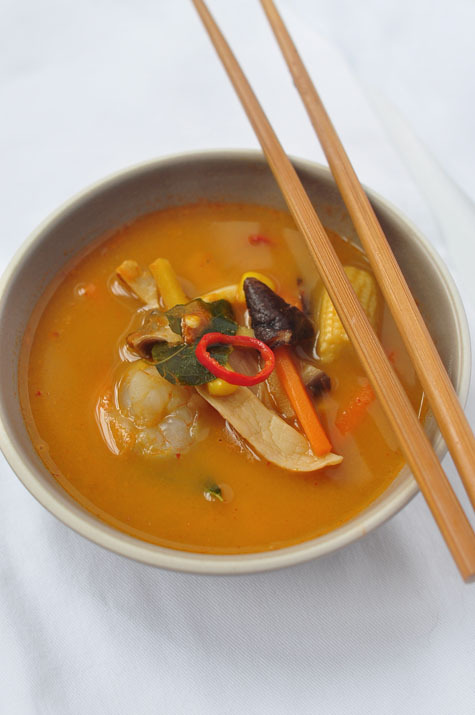 The long list of ingredients in this Thai inspired recipe could mislead you into thinking that this soup is complicated. In fact, it is very easy to put together. Pour the stock into a pan and add the slices of fresh ginger, the chopped lemon grass and half the lime leaves. Add half the chopped chives to the pan with the coriander stalks. Bring to the boil, then reduce the heat. Cover the pan, then simmer gently for 20 minutes. Strain the stock. Rinse the pan, then add the oil and shallots. Cook over a medium heat for 5 – 10 minutes, stirring occasionally, until the shallots are just beginning to brown. Stir in the stock, coconut milk, the remaining lime leaves and half the fish sauce. 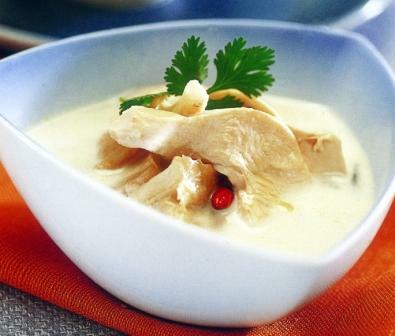 Heat gently until the soup is just simmering and cook over a low heat for 5 – 10 minutes. Stir in the curry paste and the peeled prawns and cook for 3 minutes. Add the squid, cook for a further 2 minutes. Add the lime juice, if using, and season. Stir in the remaining fish sauce, chopped chives and the chopped coriander leaves. Serve in warmed, shallow bowls sprinkled with fried shallots. You could also replace the squid with fresh mussels. Steam 675g / 1 1/2 il closed mussels in a tightly covered pan for about 3 minutes, or until the shells have opened. discard any that remain shut, then remove the mussels from their shells. 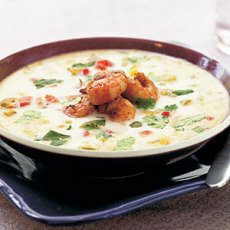 This entry was posted in Soups and tagged coconut curry shrimp soup, coconut shrimp soup recipe, seafood chowder with coconut milk, seafood stew coconut milk, thai coconut fish soup, thai coconut seafood soup, thai fish soup with coconut milk on January 4, 2013 by Jeff. Chowder takes its name from the French word for cauldron – chaudiere – the type of pot that was traditionally used for soups and stews. 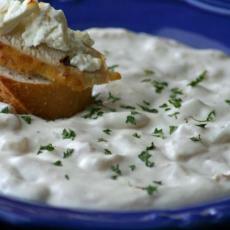 Like most chowders, this is a substantial dish, which is good served with crusty bread for a lunch or supper. Place half the drained corn kernels in a food processor or blender. Add a little of the milk and then process until the mixture is thick and creamy. Set aside. If you dont have a food processor, then simply chop the corn kernels finely and transfer to a bowl. Beat in the milk a little at a time until the mixture is thick and creamy. Melt the butter in a large, heavy pan, add the leek, garlic and bacon and gently fry for 4-5 minutes until the leek has softened but not browned. Add the diced green or red pepper and the chopped celery and cook over a very gentle heat for 3-4 minutes more, stirring frequently, until the pepper and celer have softened slightly. Stir in the rice and cook for a few minutes, stirring occasionally, until the grains begin to swell, then sprinkle flour evenly over the top of the rice and vegetables. Cook for about 1 minute, stirring all the time, then gradually stir in the remaining milk and the hot stock. Bring the mixture to the boil over a medium heat, then lower the heat and stir in the creamed corn mixture, with the whole corn kernels. season well. Cover the pan and simmer very gently for about 20 minutes, or until the rice is tender, stirring occasionally. And a little more chicken or vegetable stock or water to the pan if the mixture thickens too quickly or if the rice begins to stick to the base of the pan. Cut the corals away from the scallops and set them aside. Slice the white flesh into 5mm / 1/4in pieces. Cut the white fish fillet into bite sized chunks. 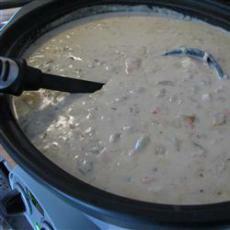 Add the scallops and chunks of fish to the chowder. Stir gently, then cook for 4 minutes. Stir in the scallop corals, chopped parsely and cayenne pepper. Cook for a few more until the scallops are just cooked and heated through, then stir in the cream, if using. 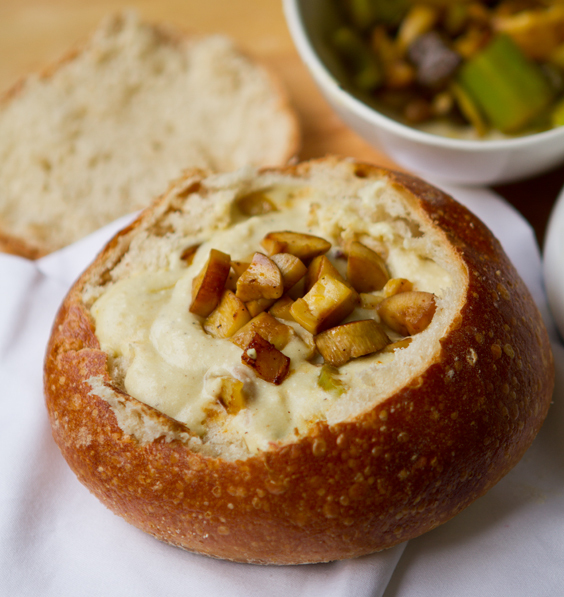 Adjust the seasoning and serve the chowder with thick slices of crusty bread. 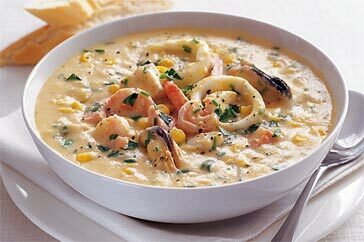 Jamie Oliver did an awesome and simple corn seafood chowder with smoked haddock and spiced tiger prawns. This is still available to watch on 4oD if your in the UK. 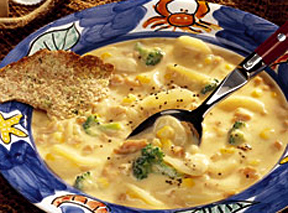 Jamie Olivers smoky haddock corn chowder. Its also available in his awesome book, Jamies 30 Minute Meals. Jamie also does a really quick and easy fish stew as show in the video below. 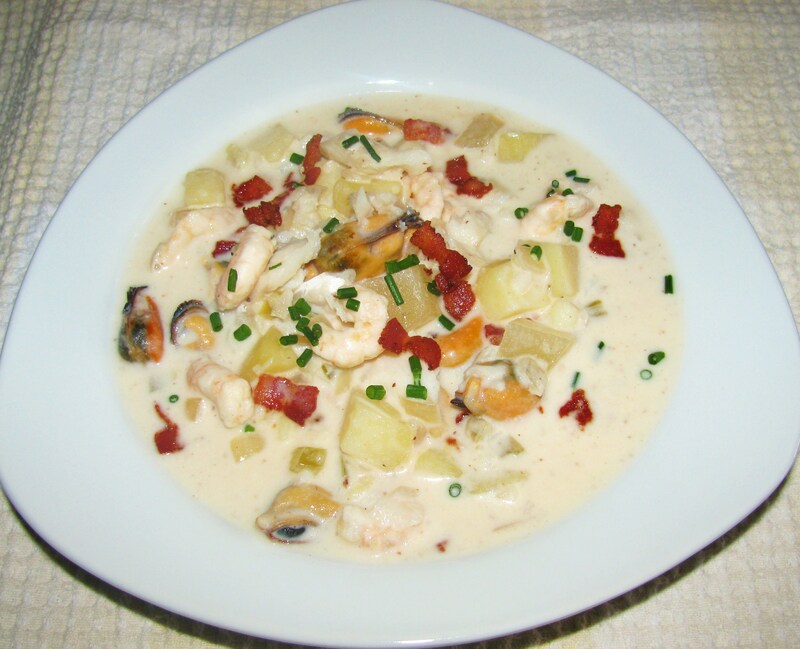 This entry was posted in Soups and tagged creamy seafood chowder recipe, fish chowder, fish pie, how to make seafood chowder, seafood chowder jamie oliver, seafood chowder rick stein, seafood chowder soup recipe, simple seafood chowder on January 4, 2013 by Jeff. The delicate sweet taste of clams and the soft earthiness of wild mushrooms combine with potatoes to to make this a great meal on its own – fit for any occasion. Place the clams in a large, heavy pan, discarding any that are open. Add 1 cm / 1/2 in of water to the pan, then cover and bring to the boil. Cook over a medium heat for 6-8 minutes, shaking the pan occasionally, until the clams open (discard any clams that do not open). Drain the clams over a bowl and remove most of the shells, leaving some in the shells as a garnis. Strain the cooking juices into the bowl, add all the clams, and set aside. Add the butter, onion, celery and carrot to the pan and cook gently until softened but not coloured. Add the mushrooms and cook for 3-4 minutes until their juices begin to appear. Add the potato slices, the clams and their juices, the stock, thyme and parsley stalks. Bring to the boil, then reduce the heat, cover and simmer for 25 minutes. Season to taste, ladle into soup bowls, and garnish with thyme sprigs. 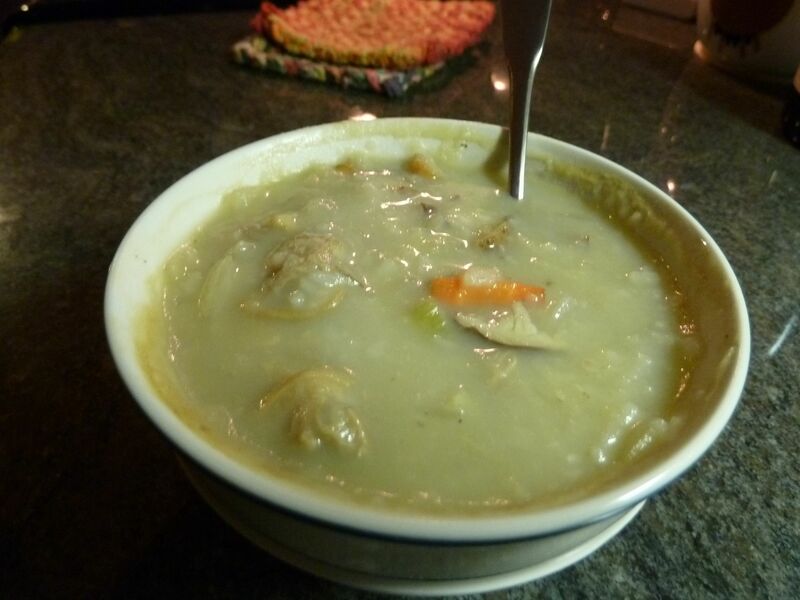 This entry was posted in Soups and tagged best clam chowder recipe, clam chowder ingredients, clam chowder recipe, clam chowder recipe wow, clam chowder soup, easy clam chowder, easy clam chowder recipe, make clam chowder on January 4, 2013 by Jeff.